EVERY chap worth his salt loves whittling – that is, cutting wood with a small knife – and a very good thing too, for it is a real backwoods accomplishment. You know how the Chief talks about the frontiersmen who carve their own buttons and collar studs, even though they have only an axe to do it with. Your Scout staff gives you a splendid chance of applying your skill at whittling, and at the same time you will be helping to rid some people of the idea that a Scout is a chap who goes about staff carrying a broomstick. A real Scout must have a real staff. The rough ash ones now generally sold are splendid – they look thoroughly “woodcrafty,” and are very light and strong; but I want you to go one better than that and make your staff a real thing of beauty. Never mind if it is a crude type of beauty. If you have really put all your skill into it you will always look upon it as one of your very special treasures, and when, if ever, Scouting days are over, you will hang it up over the mantelpiece, where you can see it as you sit by the fire, wearing carpet slippers and eating bread and milk, at the age of about ninety-nine. First of all you get the staff. Get an ash one, rather thick, so that it will stand whittling away. Ash is quite the best wood, being both light and strong. You will remember that Achilles’ spear was made of ash. I wonder if you know anything about him? If not, look him up, and then, whether you carve a staff or not, reading this article will not have been time wasted. Probably the first thing you would like to work into your staff decoration is your Patrol totem. 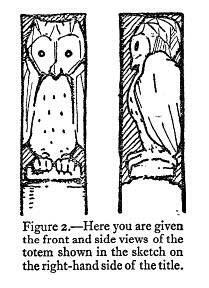 If you happen to be a member of the Owl Patrol you might carve a rough figure of an owl, as you see illustrated in figures 1 and 2. The way to set to work is first of all to flatten the sides of your staff at the end, enough to give you a surface to work on. Then draw the outline of your bird or beast with a pencil. Having done this to your satisfaction you cut a few notches as starting points and gradually carve out the details of the figure. 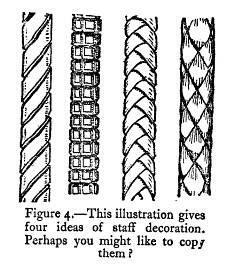 You can if you like make your staff to resemble a Red Indian totem pole, as you see illustrated on this page. But remember that the redskin is not the only type worth copying, and that there is plenty of better material available nearer home, which is far more worthy of a Scout’s imitation than Indian art. You may use in your staff scheme such things as the arms of your town, or church or school, or perhaps the symbol of your particular saint or hero could be worked in somehow. You see illustrated in figure 1 an idea for the tops of the staves of members of the Owl Patrol, 1st City of London Troop, introducing the troop badge of the Lord Mayor’s Own Troop, London. Having done the top of your staff, you need not be in a hurry to complete it, just do a little bit now and then, and take your time over it so that you do it really well. Possibly you will arrange a series of little panels all down your staff on which to brand the records of all these spare time activities, the tests you pass and the camps you attend. In that case I must not write too many of these articles, or you will all be needing staves about 10 ft. long, though you might get over the difficulty by having two staves, one for Sunday and one for weekdays. Another idea for your staff is a gadget for finding a right-angle. It is always useful in mapping or surveying, or even in laying out a garden or a cricket pitch. 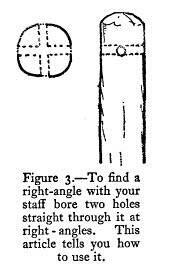 To make this you simply bore two holes straight through your staff at right angles, one to the other. This needs doing with great care in order to get the angle exact. Then when you want to get a right-angle laid out you simply stick your staff in the ground, squint through one of the holes and get a pal to put in a stick in line with your eye, something like getting “centre” at cricket. Then put your eye to the other hole and repeat the process and you have a right-angle. This book will only be read by sensible chaps, so I know you can be trusted with a spike on the bottom of your staff. It comes in very handy when you use your staff as your hiker’s tent pole. You just jab it into the ground and there you are. Remember, though, when you are using your staff for feeling your way at night, that unless you turn it the other way round the clink of the metal spike against a stone will give you away at once. One thing more. A staff needs a sling, for it is very convenient to sling your staff over your shoulder when you are hiking along and want both hands free for writing your log or drawing a map or sketch; also, in a crowded town quite the best way of carrying the staff is to sling it over one shoulder where it gets in nobody’s way. There is just one more thing to say, and that is – always carry your staff when in uniform. This is the wish of the Chief Scout, so don’t let him down and say a staff is a nuisance. If you have only a broomstick, of course it is rather a bore to carry it, but even a broomstick could be made into something like the staff in the sketch, and then anyone would be jolly proud to be seen carrying it. There will be no need for a staff brand for this, the staff itself is sufficient evidence of your handicraft. This page was last edited on 20 October 2011, at 16:45.